How do we know about the ancient past of Iran? This site, a huge stone platform larger than several football fields dotted with ruined buildings, fallen columns and intriguing sculpture, was, and still is, known in Iran as Takht-I Jamshid ("the throne of Jamshid"), or Chilminar ("the thousand columns"). 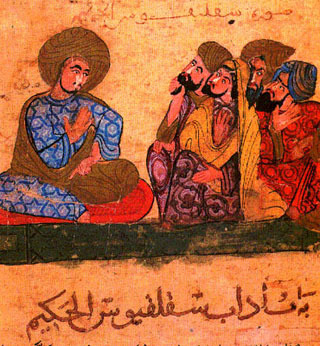 Who was Jamshid? And where was his court? According to the Shahnameh (Book of Kings) written by the poet Firdowsi and drawn from earlier stories and traditions, he was the ruler of the world, who after numerous successes (including the discovery of alcohol) overreached himself and fell from favour. He was given a golden throne (takht) by the higher powers, where he sat shining like the sun. People from all over the world came to do him honour at a newly-introduced festival: Now Ruz (New Year) celebrating the end of winter and the start of new growth on 21st March (a festival still celebrated by Iranians all over the world). After reigning well for 300 years, Jamshid began to go off the rails. He offended the higher powers, starting to believe he could rule without them. He lost his army, and his kingdom descended into chaos, and was taken over by the powers of evil, led by Zahhak. The vile Zahhak ruled for 1000 years, terrorising mankind with the two snakes that grew from his shoulders, who demanded a daily ration of human brains. He was finally captured and imprisoned under Mount Damavand. And so the great site, which must have belonged to a mighty ruler, became known as Takht-I Jamshid: the Throne of Jamshid. From about AD 1600,, travellers from Europe began visiting Iran, where the kings of the Safavid dynasty were creating a state whose culture and sophistication eclipsed anything in Europe at that time. Some of these visitors had studied Latin and Ancient Greek at school, and could tell the Iranians things they’d learned about the ancient Greeks and their wars with the Persians. Things that IRANIANS at the time did not know, as their ancient history was known only through the stories told by the poets. Because they knew their ancient Greek history, European VISITORS seemed to know more about ancient iran than the iranians.. The Ancient Greeks had known not only who built Tahkt-I Jamshid, but who destroyed it. Not so surprising - it was one of them! After its destruction it became known by the name the Greeks called it: Persepolis ("City of the Persians") A name that became lost in Iran until its true identity was reestablished. It’s a deadly name. It's Greek, of course, for "the City of the Persians". But in Greek it also means “sacker of cities”, “destroyer of civilisation”, a name that aptly describes its first Greek visitor, the same one who destroyed it in 330BC- Alexander of Macedon. Earlier (in 490 BC and again in 480 BC) it had been the Greeks' turn to be scared when the Persians had threatened them: persai in Greek means “Persians” but also “to destroy; to sack”. How could Iranians not know their own history while the ancient Greeks (and hence educated Europeans) did? Mainly through luck. The ancient Persians were very unlucky. Their own writings disappeared because They wrote on leather, a substance which soon decays if it’s not very carefully looked after, and they were unlucky that no one who came later did preserve it. Not everything was lost though. 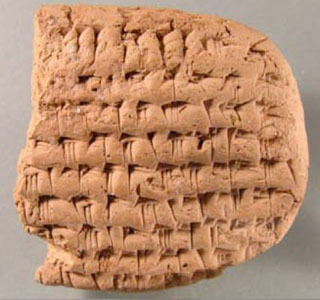 Once Iran became aware of its history, inscriptions, objects and - most importantly - thousands of baked clay tablets were found, which can tell a very great deal about the “missing” history of ancient Persia. The ancient Greeks were lucky. Their writing on flimsy papyrus - old-fashioned and primitive technology compared with the Persian leather - would similarly have been lost except for two things: in ancient Egypt (hot and dry then as now) papyrus was preserved in the sand, mainly in ancient “landfill”. It was considered rubbish. Egyptians recycled the backs of papyri on which Greek plays, poetry and history had been written for their shopping lists, love-letters, school exercises and other everyday needs. Then threw them away. After 2000 years of being buriedin the sand, the rubbish dumps are being dug up and the ancient Greek papyri are being read. But only a tiny percentage of ancient Greek writing survives this way. Most of it - hundreds and hundreds of books, poems, plays, history, philosophy, novels, books on geography, astronomy, economics, travel, farming, bee-keeping: you name it - survived although the original papyrus perished 2000 years or more ago. A great deal was lost, but much survived, because, luckily, their successors kept copying them out - generation after generation. This was something that was not done by the successors to the ancient Persians. Some of this survival was a very close run thing: many manuscripts were preserved by Christian monks in monasteries (during centuries when very few people could read or write) , and ironically, much of the Greeks’ learning, especially in science was preserved because Persian and Arab scholars translated it into their own languages, at a time when hardly anyone in Europe could understand ancient Greek - or had any interest in science and maths. Then, starting in the 14th century AD, came the Renaissance. Europeans suddenly realised what they’d been missing with the disappearance of the writings of the ancient Greeks (and Romans too) and the search was on. Manuscripts were tracked down, and before long, the ancient writings were being circulated through the new technology of printing. Arabic translations of Greek writing on science and maths were retranslated into Latin. Today anyone can read the writings of the Greeks in their own languages; for example, Homer’s Odyssey is read in translations from Greek not only throughout Europe and the English-speaking world, but in Japan, Brazil, China - and Iran. A mysterious world heritage site in Iran. We now know a great deal about it, ironically, thanks to the Greeks - who destroyed in it in the 4th century BC. Archaeological discoveries have added considerably to our knowledge of ancient Persia, where once we depended almost entirely on the writings of the Greeks. There's a much fuller treatment of the "rediscovery" of the Achaemenids elsewhere on this site. Something very similar happened in England. Stonehenge, also a World Heritage Site, is an equally mysterious place - which has been ignorantly associated with the Romans, Druids, King Arthur. 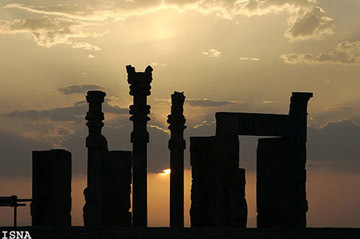 Unlike Persepolis, still nobody knows who built it, and when, although its astronomical purpose may be becoming clearer. Lived AD 1048 - 1131 in Persia. He was one of the greatest medieval astronomers and mathematicians, who also wrote on many other subjects, from music to mechanics. In the west he's much better known, though, as a poet. This is because a selection of his verses was translated and adapted in England in the 19th century by Edward Fitzgerald. Fitzgerald's "Rubaiyat of Omar Khayyam" became a best seller - although its theme of "eat, drink and be merry" may not reflect the original Khayyam. Iran's "Shakespeare" - still one of the most popular poets. He started writing the Shahnameh in 947 AD, and spent 30 years on it. Shanameh means "Book of Kings" and it tells tales of the rulers of Iran before the Arab conquest: the early parts are not exactly fiction, but reflect what Persians in his day believed about their past. The later parts, dealing with the Sasanians (rulers of Persia from 224 AD) are historically quite accurate. Compare Shakespeare: his stories of early British kings - Lear, Cymbeline, Macbeth - don't have much to do with factual history, though from Richard II onwards they do reflect what the Elizabethans believed about the recent past. The oldest evidence of alcohol use really does come from Iran. Archaeologists discovered six narrow-necked pottery jars, each holding 9 litres, with wine residue - including resin (as in Greek retsina) dating from around 5000 BC. ironically it is illegal to drink alcohol in Iran today. Shah Abbas (ruled Iran from AD 1571 - 1629 ) restored much of the territory that Iran had lost to Turks, Uzbeks, Mughals and Portuguese. His capital at Isfahan is still one of the world's most beautiful cities. Compare ancient Persia with Germany: the German tribes had no written language until the 4th century AD. Like the Persians, their early history is known through foreign and mostly hostile sources: the Romans, for whom the Germans were a troublesome enemy. Ctesias, a Greek who lived in the Persian court, and wrote a massive book about the Persians "says it was from the royal records written on leather hide, on which the Persians have their ancient deeds recorded in accordance with a law, that he learned the details and recorded them and published them in his history for the Greeks." A Zoroastrian text from c AD 300 says Alexander destroyed the archives of Persepolis "written upon cow-hides with gold ink". These are the Persepolis Fortification Archive and the Persepolis Treasury Archive. We shall see what an important source of information they are for the administration of the Persian empire later on. Details here. The Iranian New Year festival is probably the world's oldest continuously celebrated festival. It's certainly much older than any Christian, Jewish or Muslim holidays. The Persians had a rich and full mythology which told of their origins and their kings. But this mythology originated far away from Persepolis, in lands to the east. From there came colourful tales of wars and kings - which make no mention at all of the Achaemenids who built Persepolis and created the Persian empire. For a closer look at this "alternative history" of Iran, look here. In a similar way, the Greeks of the 5th century only knew their ancient history through the poetry of Homer. The first European visited and described Persepolis in 1328, but it wasn't until 1787 that J.G.Herder correctly identified it as the residence of the Achaemenid kings. That's why we use Greek names rather than the proper ones - Persia, Media, Babylonia are all the names the Greeks used. So are even the personal names of the Persian kings: we should be calling them Kurush (not Cyrus), Kambujiya (not Cambyses), Darayavaush (not Darius) and Khshayarshan (not Xerxes). "King Cambyses" was a popular play by a contemporary of Shakespeare. In 1560, Cambyses would have been more familiar to an audience in London than to one in Iran.